Ripening strawberries are very susceptible to anthracnose. The pathogen spreads rapidly through fruiting fields during rainy, warm harvest seasons and can quickly destroy a crop. Light-brown water-soaked spots form on ripening fruit and rapidly develop into firm round lesions followed by the eruption of pink spore masses in a slimy sticky matrix which are dispersed by splashing or wind-driven rain. “In Canada, strawberry is cultivated mainly in Quebec, Ontario, British Columbia and the Atlantic provinces. Ontario ranks as the second highest strawberry producer (30%) in the country, with a farm-gate value of Cdn$ 20.8 million. Most of the fruit produced in Canada are from June-bearing cultivars, with a season that usually spans 5-6 weeks in June and July. In the off-season, large quantities of strawberries are imported, which were five times higher in 2011 than in 2003. The Canadian strawberry industry has given high priority to cultivation of day-neutral strawberry to become more competitive with the import market and increase the availability of fresh Canadian-grown strawberries to 4-5 months. Anthracnose fruit rot (AFR), caused by Colletotrichum acutatum Simmonds, is one of the major diseases affecting yield in Ontario and other provinces. Pre- and post-harvest fruit rots caused by the fungus reduce marketable yields and the marketability of fruit, respectively. Long wet periods and warm temperatures (20-25 °C) during flowering and fruit development are favourable conditions for development of anthracnose fruit rot. With the increase in production of day-neutral cultivars in Canada, attention should be given to the differences in cultivation practices from June-bearing cultivars. 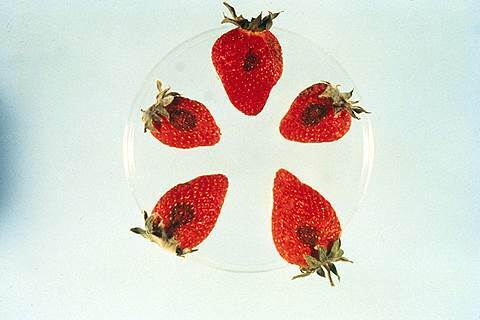 Since day-neutral strawberry have a longer cycle of fruit production, the risk of diseases and pests is also higher and thus different management strategies are required. Authors: Burlakoti, R. R., et al. Affiliation: Weather Innovations Consulting LP. Title: Evaluation of epidemics and weather-based fungicide application programmes in controlling anthracnose fruit rot of day-neutral strawberry in outdoor field and protected cultivation systems. Source: Canadian Journal of Plant Pathology. 2014. 36:64-72. This entry was posted in Fungicides and tagged anthracnose, Anthracnose Fruit Rot, British Columbia, Canada, fungicides, Ontario, pathogens, Quebec, strawberries, Strawberry Producers by pesticide guy. Bookmark the permalink.